I am so excited to share this craft with you! GB and I've been working towards this craft for quite awhile. I saw this great idea on Sweet Something Designs a long time ago. For months GB and I have been saving bottle caps for this craft. We found ourselves pocketing beer caps at parties and at bars. Now it's become habit. I had so many caps leftover after this craft - my head is spinning with other options. The blogger is crazy serious and pours acrylic water (check out her blog post to learn about that.) I decided to be a little less serious. I started by gathering all of our beer caps. I removed the condiment dishes and lined bottle caps throughout the tray. Next I separated the caps evenly in 4 groups. Then I spray painted each group. I had to spray two coats - the paint didn't adhere the first go around completely. After an hour or so the caps were ready. I lined the caps up in the tray determining whether to use a pattern or not. I was able to line the caps without a specific pattern. I loved the non-pattern. Next, I add hot glue to two sides of the cap. The glue dried fast so I had to place the caps quickly. I'm not sure if this will be a permanent fixture in the kitchen - but I absolutely love my little tray! This was a very easy craft! If you create this fun look - don't forget to tell me all about it! Super cute! I was getting ready to make this and realized I had dumped my bottle cap stash. Now to start over. Sigh. 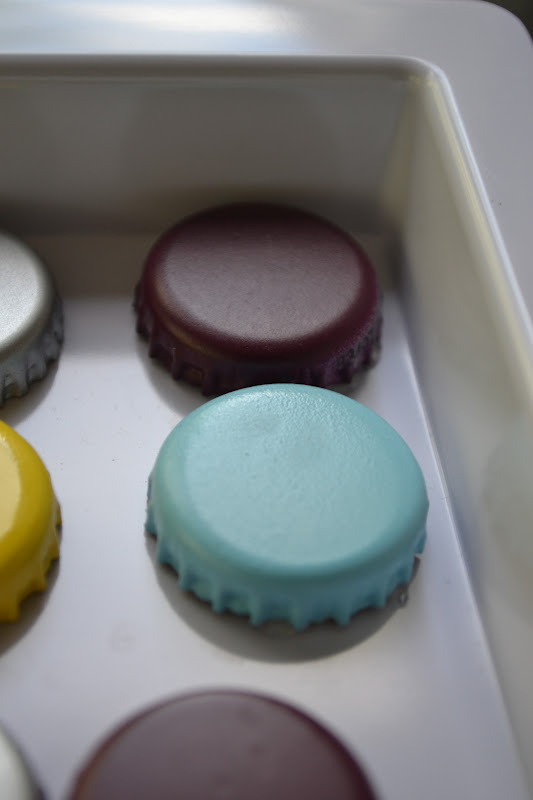 you can also get beer caps from bars and restaurants that sell beer.. they will save them for you if you ask!